The BRAT diet was once considered the best treatment for children with diarrhea. Experts believed it that it gave the stomach a chance to rest as it was bland and reduced the amount of stool. However, the American Academy of Pediatrics no longer recommends this diet for children. 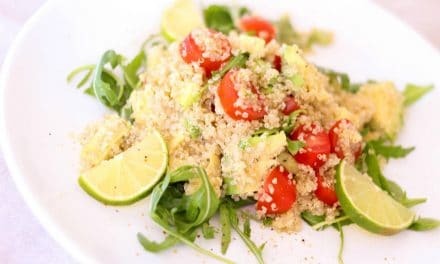 They feel that is diet is restrictive and it doesn’t give the body enough protein, micronutrients and macronutrients for healing. These experts now believe that the children should start eating a well-balanced diet within 24 hours of getting sick. They should eat a diet that is rich in nutrients and contains a mix of fruits, vegetables, meats, carbs, and yogurt. 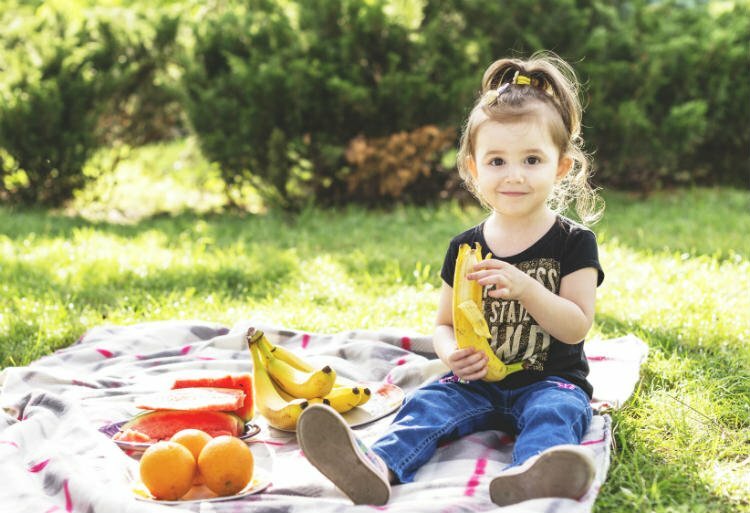 Read on to learn about the drawbacks of BRAT diet and the correct way to stop diarrhea in its tracks. What is a BRAT diet? 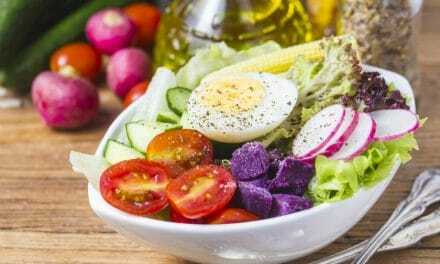 Pediatricians used to recommend this diet for children with diarrhea as it reduced the amount of stool produced and gave a chance for the stomach to rest. The idea behind eating these foods is that they are considered easy on the stomach. These foods are low in fiber, so they can stop diarrhea by firming up the stools. Due to the bland taste of these foods and the absence of smells, these foods prevent nausea and vomiting. This diet is now being questioned for its effectiveness and safety. Experts now feel that this diet provides an inadequate amount of protein, fats, and energy for a growing infant (1). 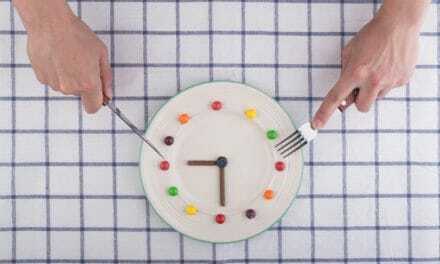 Because this diet does not provide enough nutrients, it should be considered only for a short period. If you follow the BRAT diet for an extended period, you run the risk of malnourishment. Experts now recommend that you should begin eating a regular diet within 24 hours of having diarrhea and vomiting. Studies have also found that proper nutrition is more effective in treating diarrhea. During a 2006 study, HIV patients with a history of diarrhea were given a diet that was high in soluble fiber, low in insoluble fiber, low in fat and lactose-free. They experience a 28 percent reduction in stool frequency (2). This study shows that following a nutrient dense diet help in treating diarrhea. If you have diarrhea or are recovering from it, you must eat foods that are bland and don’t aggravate the digestive system. They should help you stay nourished and help absorb some water from the stool. These nutrition-dense foods are energizing, and they keep you hydrated. Oats have soluble fiber, which serves as the bulking agent for your stool when you have diarrhea. Oats are nutritious, and they sweep through the digestive tract pulling toxins with them. Soaking oats overnight helps in removing the antinutrients that can cause digestive problems. You can also add a banana to your oatmeal to sweeten it and to add to its nutritional content. Bananas are an excellent choice for settling an upset stomach as they are bland and easily digested. They are rich in potassium, which helps in replacing the electrolytes that are lost due to diarrhea. Bananas are rich in pectin, which is a soluble fiber that helps to absorb liquid in the intestines and move the stool along smoothly. According to a 2001 study, when green bananas are cooked along with a rice-based diet, it helps in the management of persistent diarrhea in hospitalized children (3). Bone broth is rich in vital nutrients like calcium, magnesium, phosphorus, silicon, and sulfur that are easily absorbed by the body. It contains amino acids that help in reducing inflammation and improving digestion. Bone broth is easily digested and is soothing for the system, which makes it the ideal food for people with diarrhea. Most of the bone broth that you get in the market these days isn’t real. It is made from lab produced meat flavors and soup and sauce mixes. If you want real bone broth with real benefits, you must make it at home. Probiotics provide healthy bacteria that work in the intestinal tract to create a healthy gut environment. Diarrhea can throw the microbes in the gut off balance. Probiotics can help treat diarrhea by restoring this balance of bacteria in the gut. Studies have also shown the significant benefit of probiotic strains like Lactobacillus GG and S. Boulardii in the treatment of diarrhea. These probiotics help in reducing the duration of diarrhea by one day on an average. They also help in fighting off infections (4). Some of the best probiotic foods that help with diarrhea include yogurt, kombucha, natto, apple cider vinegar, and miso. Sweet potatoes contain potassium, vitamin A, vitamin C, and vitamin B6. They have potent anti-inflammatory properties, and they provide soluble fiber, which helps in reducing the symptoms of diarrhea. Sweet potatoes contain beta-carotene which gets converted to vitamin A. According to a study in Mozambique, orange sweet potatoes prevent and reduce the period of diarrhea in children (5). Mashed potatoes are also rich in potassium and contain starch, which makes them helpful in reducing diarrhea. Root vegetable juices have a healing effect on diarrhea as they have antiseptic properties that are necessary for calming the digestive system. Carrot juice contains calcium and magnesium, which helps soothe and tone the intestinal walls. Juices of lotus roots, jicama, fennel, ginger, and celery are all beneficial. Ginger acts as a tonic for the digestive system. It has anti-inflammatory, analgesic and anti-bacterial properties which help in healing all stomach ailments. Drinking ginger tea can assist in rehydrating the body and replenishing the fluids lost during bouts of diarrhea. According to a 2007 study, ginger is an effective treatment for diarrhea caused by E. Coli (6). It works by blocking toxic bacteria that causes diarrhea and preventing fluid from accumulating in the intestines. Flaxseed oil is made from flaxseeds that have been ground and pressed to release their natural oils. It is useful in treating both constipation and diarrhea. During a study, flaxseed oil and mucilage were studied for their laxative and antidiarrheal activities in mice. The study found that flaxseed oil acts as a laxative to promote regularity while serving as an anti-diarrheal agent (7). Flaxseed oil is also a rich source of omega-3 fatty acid, which helps in nourishing the body, fighting inflammation and boosting immunity. 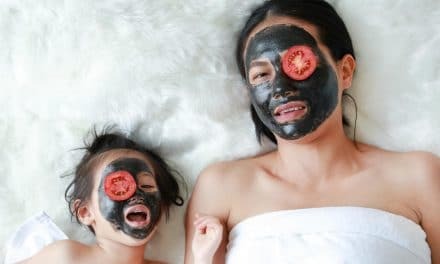 Studies have shown that peppermint essential oil can effectively limit bowel inflammation and soothe the digestive tract, which helps in reducing diarrhea (8). Menthol, an active ingredient in peppermint oil, plays the role of an antispasmodic (9). This oil helps in reducing cramping and pain in the digestive system. Scientific evidence suggests that coconut may be helpful in alleviating the symptoms of diarrhea. According to a 2010 study, coconut extract inhibited diarrhea by 30 to 57 percent in rats. The antibacterial properties of coconut help in fighting against Shigella and Salmonella. Coconut water is rich in electrolytes and is helpful in replenishing the fluid and electrolyte loss after diarrhea. Dehydration is one of the significant complications of diarrhea. So, it is crucial to have at least 10 to 12 glasses of fluids if you have diarrhea. Drinking lots of water is the best way to stay hydrated. For infants, breastfeeding reduces the risk of dehydration. Stay away from fruit juices and sodas as they increase the risk of dehydration. Certain foods can travel through your intestines very quickly and aggravate digestion and worsen diarrhea. So, it is vital to know which foods and drinks to avoid for relief from diarrhea. Avoid foods that are fried, greasy, and are covered in gravy. 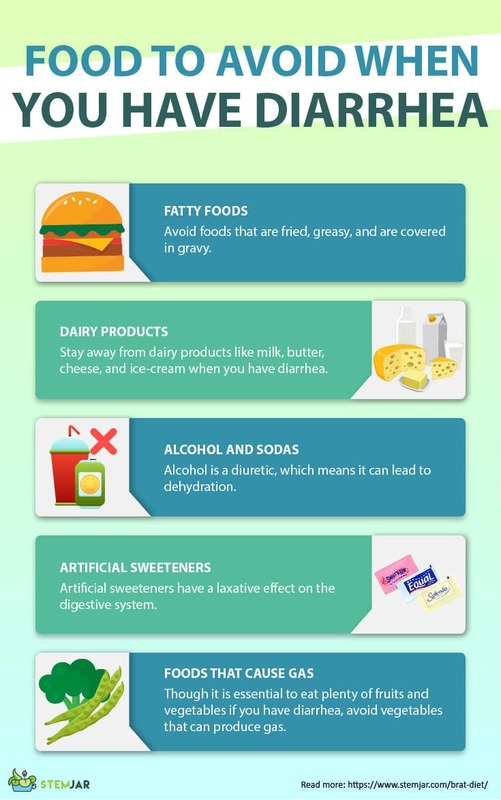 Stay away from dairy products like milk, butter, cheese, and ice-cream when you have diarrhea. You can become sensitive to dairy products if you have diarrhea even if you usually have no problem with them. Alcohol is a diuretic, which means it can lead to dehydration. Sodas contain high fructose corn syrup which can also cause problems during diarrhea. Artificial sweeteners have a laxative effect on the digestive system. If you have diarrhea, it is best to avoid products with artificial sweeteners. Though it is essential to eat plenty of fruits and vegetables if you have diarrhea, avoid vegetables that can produce gas. Cabbage, beans, broccoli, and cauliflower can increase intestinal gas. The BRAT diet includes foods like bananas, rice, applesauce, and toast. These easy to digest bland foods help firm up the stools and are easy on the stomach. While this diet may be helpful for a short period, it is not recommended to continue this diet for longer periods. Experts now recommend that you should begin eating a regular diet within 24 hours of having diarrhea and vomiting. Other foods like oats, bone broth, juice of root vegetables, yogurt, flaxseed oil, and ginger provide nutrition and improve digestion. PreviousHow Effectively Does Toothpaste Cure Cold Sore?